Fitness business owner, Jason Trzewieczynski, suspected his business was losing money each month by not accurately billing and collecting payments from members. After implementing a system with automated billing they saw an immediate increase in monthly revenue without adding new members. "Our revenue increased by over 50% the first month we used a membership management solution with payment processing and we saved about 15 hours a week in the basic administrative tasks." Automated billing benefits you and your clients. You save time, increase security and receive more payments. Your customers are empowered to manage their payment preferences for increased customer satisfaction and can focus on the value of your service not the price. 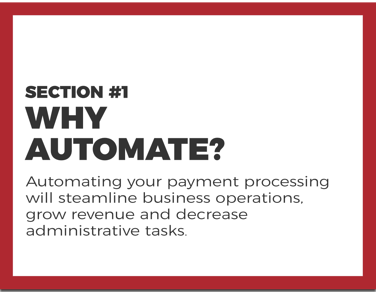 Download this payment processing guide and see if you're missing out on revenue!